Today, while waiting for my tour guests at Splash Mountain, I had the chance to take a closer look at the ride photo checkout area. 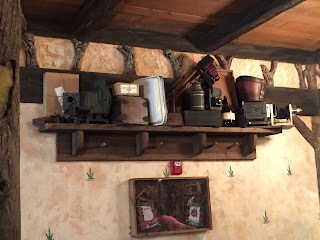 It is totally themed like a rustic, old photography studio. There are old fashioned cameras, bottles of developing fluid, and photo paper all over the shelves in the shop. This is just another example of the amazing details that are so often overlooked by guests.